Are there general guidelines I need to be aware of when sealing exterior concrete in colder temperatures? As a general rule, 50 degrees F is the minimum ambient air and surface temperature needed when applying most concrete sealers and coatings. All sealers and coatings have a minimum film-forming temperature, or MFT. When the temperature falls below the MFT, cross-linking does not occur and the sealer film does not come together properly. Typical signs that the sealer MFT was not met include white hazing, white dusting, and delaminating. It's easy to judge air temperature by looking at an accurate outdoor thermometer or getting a current local weather report. Obtaining surface temperature is a bit more challenging. I have found that using an infrared temperature gun is the best way to get accurate concrete surface temperature readings. 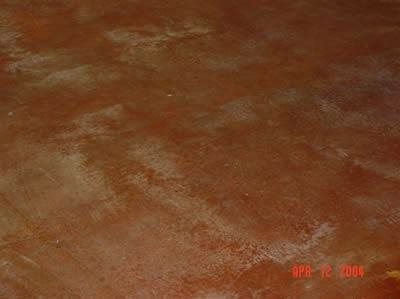 Another factor to consider when sealing concrete in temperatures at or close to 50 degrees F is the type of solvent the sealer is based on. Since temperature is a catalyst, the colder the temperature, the slower the sealer cures. When the weather gets colder, switching to a sealer that uses a faster solvent might help avoid problems. Water is the slowest of the solvents, so I would avoid use of a water-based sealer when outdoor temperatures drop. Acetone is probably the fastest solvent, so consider using a sealer with a high acetone content when sealing in cold temperatures. As an added note, spraying vs. rolling is always recommended when applying sealer in colder temperature because it leaves even, thin coats for the best possible cure. I often hear from applicators who say they have been applying sealers successfully at air temperatures of 35 to 45 degrees F for years. Every project has different environmental factors to consider, thus the 50 degree rule is a suggested safe guideline. Those who choose to seal concrete at temperatures below 50 degrees increase their risk for failure substantially. Is it better to be safe than sorry? From the number of emails and calls I receive to help solve cold-weather sealer problems, I think safe. If a sealer fails because it was applied below the MFT, often the only remedy is labor-intensive and costly stripping and resealing. Deep Penetrating Sealer RadonSeal - Waterproofs & strengthens. Wet Look Lacquer Green Provides a "wet look" for concrete. Fast drying. Clear-Seal by Increte Systems Seals and protects decorative surfaces. Penetrating Sealer 101 - V-Seal 1 Gallon - $39.95. Water Repellent Penetrating Sealer for driveways, parking structures, plazas, walkways & more. Polyaspartic Concrete Sealer Economical yet functional, wet concrete look. Protective Urethane Coating Fast drying, zero VOC low odor sealer.